Hill-Murray is the girls hockey AA state champion. In the last four school years, Hill-Murray teams have qualified for 14 state tournaments and 8 championship games in various sports, but this is the school's first title since boys hockey in 2008. Congratulations to the girls and head coach Bill Schafhauser! The Pioneers were 12-1 and will split the title with St. Thomas Academy. And that's the end of the CSC, which was formed in 2001-02 and will be rechristened the Metro East Conference next season. Richfield is out and Hastings is in. Sam Illgen set a new school record with 53 saves against Blaine, topping James Fangel's 47 against Wayzata during the 2004 season. Fangel retains the mark for most saves in a period (25 saves on 26 shots in the second period of the same game). Mitch Slattery was named a Mr. Hockey finalist. With Hill sporting throwback white jerseys recently, see that and other classic uniforms and history at Vintage Minnesota Hockey. It's been an interesting first half of January for the Pioneers. The month began with the first shutout of a Hill-Murray team in seven years, but the Pioneers rebounded by defeating the state's second and first ranked teams. Following a win over conference rival Tartan, Hill-Murray plays White Bear Lake on Thursday in the first January game between the teams since 2001. The game will be televised live on TV19 for those in the northeast metro viewing area, and streamed live on the Horn. If the Pioneers and Bears meet again in the Section 4 Final, it will be history of a different kind: perhaps the final high school hockey game played in the Coliseum. Pioneer Press articles here and here. Bill Lechner, Jeff Whisler, and Jim Rohlik are quoted in the stories. 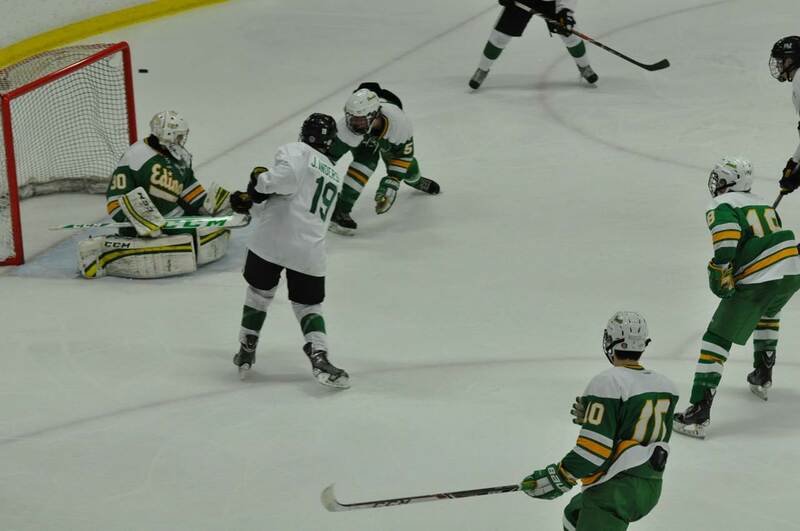 Josh French scored an extremely rare 3-on-4 shorthanded goal against Tartan. Just as remarkable was that the goal came only 7 seconds into the third period. This is the fastest goal to start a period of any boxscore on this website (which includes all games since 2000). There are three known games with goals scored 8 seconds into a period, and all three had a goal scored within 14 seconds of the start of some other period in the same game. Check this out: the 1992 consolation final had a goal at 0:14 of the 2nd, 0:08 of the 3rd, three goals in the final 1:28 of the 3rd, and stood as the longest game in Hill-Murray history for 18 years. Fast forward to this December 2005 game, in which HM scored at 0:13 of the 1st and 0:08 of the 2nd. And one year later, HM scored at 0:08 of the 1st, 0:12 of the 2nd, only to be tied by Duluth East with 0:06 remaining in the 3rd. In contrast, goals in the final second of a period, even game tying or winning goals in the final second of regulation, have occured multiple times. Merry Christmas and Happy Holiday Tourney Time! This week's schedule and live broadcast link. The 54th season of Pioneer hockey is underway. Hill-Murray plays its first home game Sat Dec 7 in this year's edition of an always entertaining series against Benilde-St. Margaret's, followed by conference rival St. Thomas Academy on Thu Dec 12. The alumni game is less than a month away on Sunday, December 29 from 3-5 pm at Aldrich Arena. Please RSVP to Tony Reif at tony@petersonenterprises.com. Updates since last season - video and more video. Last year's state tournament highlights along with a few more from the 1980s are linked from the video page. Also, I've posted a collection of state tournament tapes from the 1990s on You Tube.